Born in Normandy, Chef Franck Poupard began his career in 1987 with an apprenticeship at the one star Michelin establishment Au Petit Vatel in Alençon. Two years later, he moved to the town of l’Aigle where he became “commis de cuisine” for the hotel-restaurant Le Dauphin, renowned for being one of the first restaurants to receive a star in the 1926 Michelin guide. Passionate about travel and sport, Chef Poupard worked on the coordination and preparation of meals for the athletes during the 1992 Olympic Games in Barcelona. In 1995, he worked as “chef de partie” for the gastronomic restaurants La Table Ronde and Le Grill du Parc in Normandy. From 1998, Chef Franck Poupard worked as “sous-chef” in various restaurants in the Haute Savoie region during winter and in Corsica during summer. He then became head cuisine Chef in several well known establishments before moving to the luxurious Le President Wilson hotel in Geneva where he was responsible for the “garde-manger” and creating a fusion cuisine menu. He also worked in London for two years, in Harrods’s gastronomic establishment The Georgian Restaurant. He obtained his "Brevet de Technicien Supérieur" in 2006. 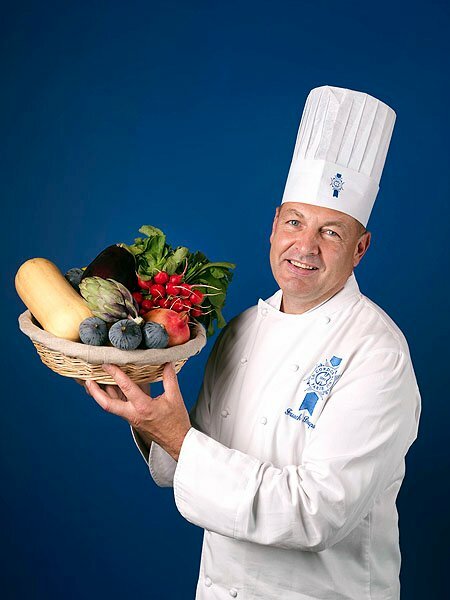 Chef Poupard joined Le Cordon Bleu Paris team of Chef Instructors in 2007.